Robot Mode: If we’re talking about Seaspray as he appeared in the cartoon or comics (as opposed to the somewhat leaner G1 toy), then a figure by that name needs to be somewhat tubby and awkward-looking. He needs to have big feet and look like he isn’t really built to walk on land. Titans Return Seaspray accomplishes all that. The figure has really big feet, looks tubby, but is still very nicely articulated. Unlike most of the Legends-class figures he comes with a hand-held weapon and he can wield it in many cool-looking poses. I am not really sure what to write here, to be honest, except that this is Seaspray, looking as if he stepped right out of the TV screen. For all those who were never really satisfied with the last Seaspray figure we got, the humongous Hunt for the Decepticons Seaspray, you can now rest easy. 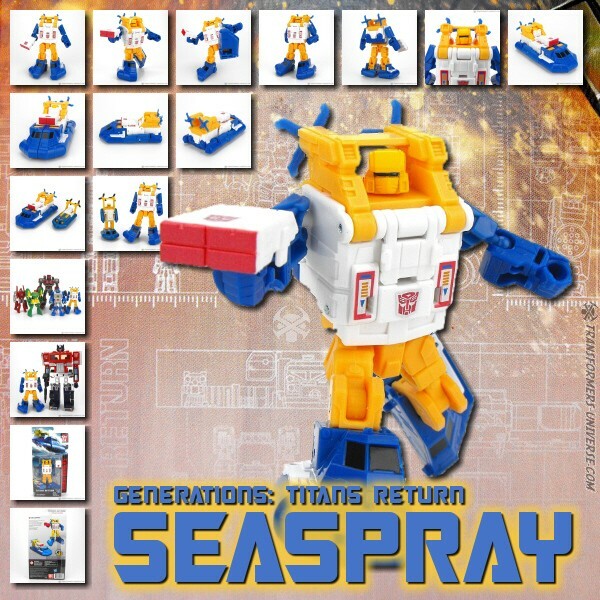 This is the Seaspray you were waiting for. No complaints about the robot mode whatsoever, a brilliant figure. Alternate Mode: Seaspray transforms into the same kind of hovercraft he did back in days of yore. Same colors, same basic shape, everything fits, just bigger. The missile launcher on top is pretty much the only noticeable difference and fits nicely onto the vehicle’s silhouette. Like most Legends-class figures from Titans Return, Seaspray can seat a Titan Master figure. Just flip open the white compartment in the back. Sadly I forgot to take pictures of that, sorry. Overall I like this mode a lot except for one thing: the robot head is still sitting right there on top of it, the face hidden by a single flip-up panel. That is actually the fault of the Titan Master cockpit, because if not for that the head could easily fold in. It doesn’t ruin the vehicle mode, mind you, but it’s definitely a point against it. Otherwise, though: very nice. Remarks: Seaspray was among the many Autobots who appeared out of nowhere in the second season of the Transformers cartoon. He starred in arguably one of the most batshit-crazy episodes of the season, namely “Sea Change”. Here he fell in love with an alien mermaid and transformed himself into a merman by way of a magical fountain that also transformed Rumble into a tree. Yeah, it’s exactly as insane as it sounds. Seaspray survived into the third season of the cartoon, but didn’t really play a big role there. Ever since Hasbro renamed the previous Scout Class into Legends class (while renaming the actual Legends class into Legion class), the figures produced in this size have been nothing short of exemplary. Case in point, Seaspray, who is a near-perfect toy adaption of the character we saw on-screen in 1985. Very nicely done except for the head issue in vehicle mode. So even if you are not a fan of the character, this is a toy worth looking at.